Our week long vacation in October had arrived again, this time mother nature had some less than favourable weather in mind. 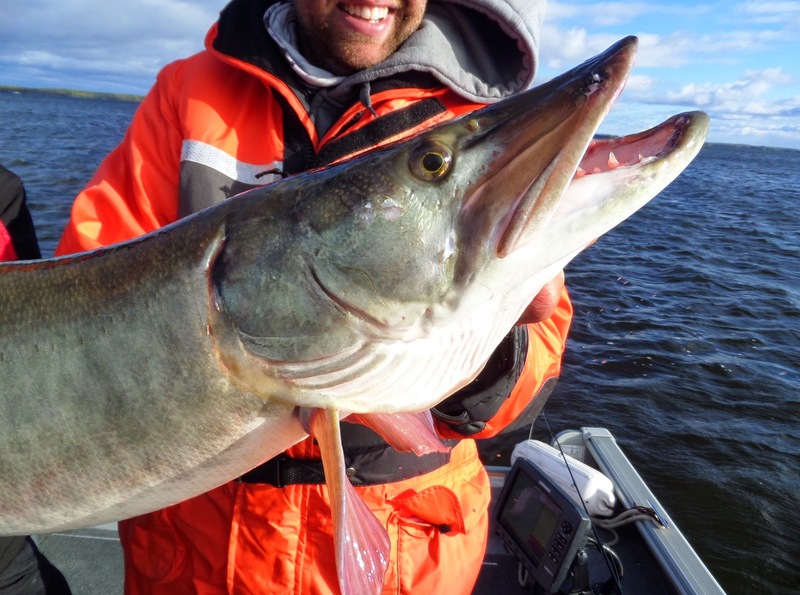 A couple of last minute cancellations had freed up a few spots for Musky Guide Andrew Klassen on Lake of the Woods in northwestern Ontario ( http://www.andrewklassen.com/ ), and I decided to book a day with him as sort of a surprise birthday present to my wife. We have both dreamed of catching a musky and a guided trip seemed like something we could afford a few years down the road. However with the down payment retained from the original client, I jumped on the opportunity to book this guide whom I had heard so many good things about. We left our cabin at West Hawk Lake on the morning of the full moon around 7 with the temperatures hovering around 0 degrees. The last few days had brought snow/rain and winds from 30 - 70 kmh, the winds were supposed to die down but the precipitation risk remained. A quick stop at a gas station at Clearwater Bay for our one day fishing license and we were off to the agreed upon boat launch to meet up for 8. After some introductions and hand shakes we transferred our food and extra layers to the boat and slowly made out way out of the marina. We went over the game plan for the day and as we cleared the no wake zone, we hunkered down and barreled off to our first location. 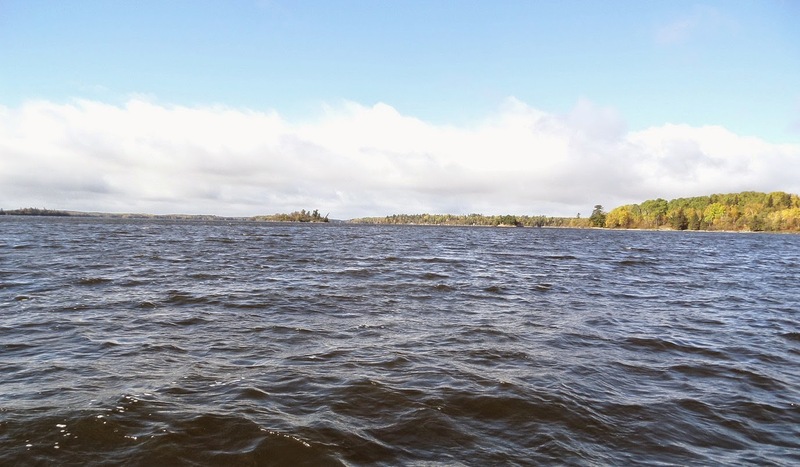 Lake of the Woods is a giant body of water, and my wife has been known to get sea sick once or twice, we let Andrew know this and he took the least bumpy path he could. Through out the whole trip she did not get nauseous once. Passing cabins of all shapes and sizes as well as the many beautiful islands made the boat ride to our first spot quite enjoyable, plenty of sight seeing if you will. We noticed at least a dozen eagles on the way as well. Once at our spot, we were provided with our rods and lures (10 - 14 inch Cisco and whitefish imitations for starters) and instructed on the use of the reel and how much line to let out for the troll. He let us know that he would have a line out as well and if a fish struck it, it would be passed off to my wife or I, common practice with most guides apparently. She thought it best if opportunity arose for me to have the first crack at it. Andrew tied on something different to his line as is usually the case to see if the musky are honing in on a different presentation and we started our troll at roughly 4 mph. In less than 10 seconds he called out "fish on", I quickly reeled in a bit and set down my rod to grab the one being passed to me. Keeping the line tight I could feel some head shakes on the end of the line. I was surprised at the ease of the fight and the almost complete control I had over this fish. My heart was racing with the thought of my first musky this quickly into the trip dead centre in my mind. It became clear near the boat it was a pike roughly 37 inches or so and into the giant cradle it went. It wasn't my longest pike, but I am confident it was my heaviest. A good start right off the hop, but we were hoping for muskies. We reset and continued to troll covering different depths and structure with all but a bump for 90 minutes or so after the first fish. After a quick break on a sandy beach near a pair of golden eagles, we were off to our next spot. We continued to troll and my wife got a bite on her lure and began reeling it in. 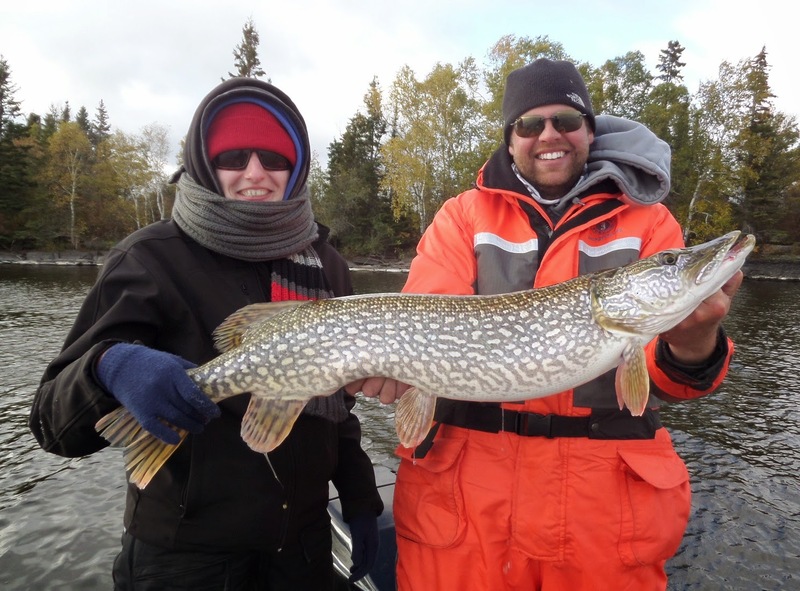 Once near the boat it was revealed to be another pike, this one around 30 inches or so who surprisingly enough unhooked itself before Andrew had a chance to try. It hit a bait a third the size of its entire body!! Through out the day the conversations were plentiful, a lot of knowledge was shared and retained. Andrew really provides so much more than just a fishing trip, stories exchanged and breaks on very beautiful small islands when asked for. 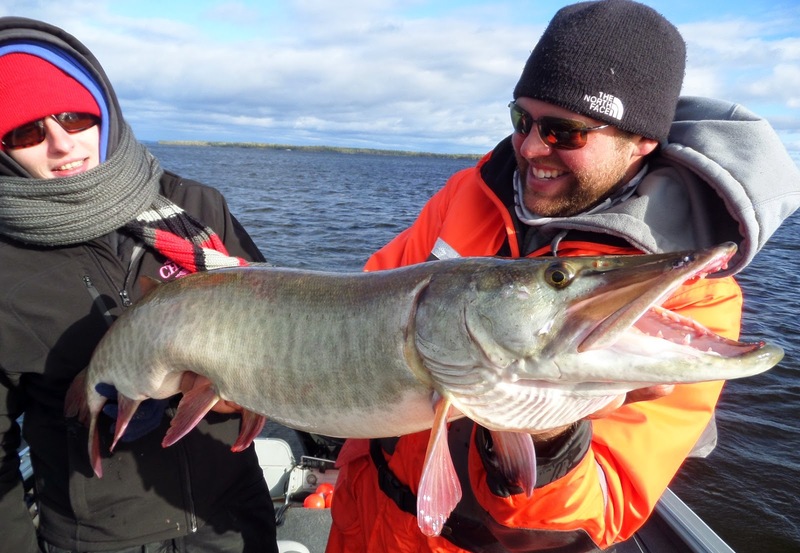 The how and why of muskies over all different open water scenarios was discussed. After trying a good handful of locations with little success, he read my mind and took us back to the spot we started the day at. It was a rocky point that held fish near by and directly on it, and we were both confident that another few passes had to yield something. It was at this point my wife and I were starting to doubt we would hook into one, but Andrew stayed optimistic. I knew we were targeting big fish on big water and it isn't a numbers game but more of a time spent and ground covered one. Hiring a guide for this kind of fishing can really put the odds in your favor though. As we passed a fox on the rocky shoreline he called out "fish on, it's a good one" and it was Kats turn to fight whatever was on the other end of the line. I reeled in as fast as I could and stayed clear out of the way, the cradle takes up most of the front of the boat and when it is being moved around you need your space.With the fish in sight, Andrew called out "We have our first Musky", and I wont lie I felt weak in the legs. He scooped it up in the net and began working on getting the hook out boat side, fish still in the water. I was so happy for my wife and she was pretty ecstatic, too nervous to hold the fish she posed for a few with Andrew holding her first Musky. Quickly back in the water it needed little time for revival and shot off with vigor. High Fives were exchanged all around and we got back to trolling to hopefully hunt down another one. After the lure Andrew was using was getting the most bites, he attached it to Kats line and tried something else. She hooked into two more pike while we trolled on, one equaling her personal best in length but clearly beating it in weight as these fish were putting on the feed bag. We eventually left the most productive spot of the day to head back closer to Kenora, trolling at a few stops along the way but nothing to show for it. On our final troll of the day Kat hooked into something that wasn't putting up much of a fight. Another ambitious smaller pike we thought as after one head shake it sort of gave up and quit fighting. 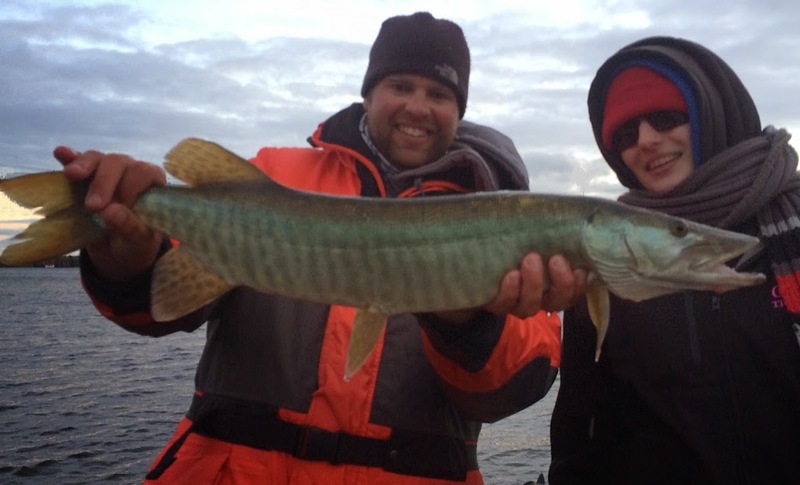 But low and behold it ended up being her second ever Musky, a tad smaller but a musky none the less. It was our first time hiring a guide and we don't regret it. It was honestly worth every penny! We cannot say enough good things about Andrew as well! 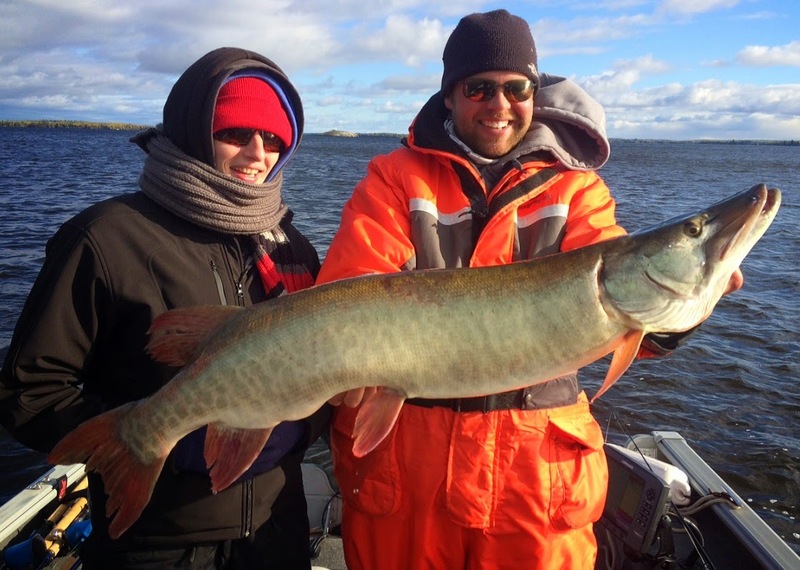 We hope to hire him again one day and I would recommend anyone interested in Musky fishing to do the same.